Sustainability is the Grand Unifying Theory for finding the Ultimate Answers to Life, Universe and Everything --- and the answer for Earthlings is Sunshine --- All else is Moonshine. Writing as an architect, it will be no surprise to anyone to hear that I get bombarded daily not only from professional institutes, magazines, manufacturers’ literature by e- and snail mail, but also like all of us, in the daily press, TV and radio, with exhortations to help save the planet, support all things ‘green’ and act at all times in accordance with the tenets of ‘sustainability’. That’s often confusing, to say the least, because while ‘green’ and ‘sustainability’ are commonly acknowledged to be ‘good things’, each of these words mean many different things to different people. So like every other designer I tried to keep abreast of things and do my CPD (‘Continued Professional Development’) duty by reading, courses, seminars, discussion groups, but in my case mainly by reading books – the subjects and their ramifications soon losing any connotation of a duty obligation but becoming an exciting mental journey of discovery. To an extent that I began to call and describe myself as the CleanEnergyPundit – a great conversation opener at any networking event following any course /seminar /discussion group. And it came to pass that at one of these social events following such a discussion group, with wine and canapés being freely proffered to anyone with at least one free hand, that I sounded off with my punditry in discussion especially with one interested other guest who then turned out to be a professor at one of the UK universities concerned with sustainable built environments, soon asking “would you like to come and talk to our students?” “Yes” was, of course, the only possible answer, and we parted having exchanged business cards in best networking style. Next day came an e-mail: ‘please let me have your topic and a time when you can come and visit us’. Wow, I had jumped in with both feet there – never actually expecting that it would come to that the evening before. So I quickly chose Sustainability as my topic by return e-mail, and we soon agreed a date after the summer recess. 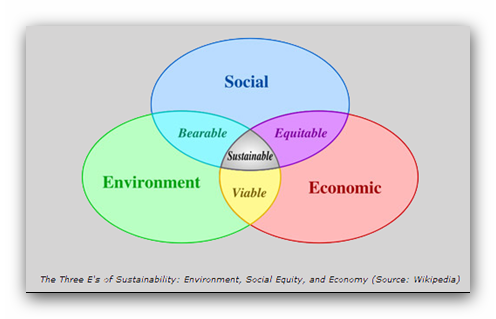 However fuzzy and undefined all of these concepts are, this logical diagram shows that sustainability can only be found at the confluence of the three other confluences between pairs among the three E’s meeting bearable, equitable and viable criteria. Seen in the light of such intricate logical connections emerging from this Venn diagram, the concept of sustainability can be seen as a sound and deep idea underlying and touching on practically all aspects of life and civilisation. …taking a hint from Douglas Adams’ “Hitchhiker’s Guide to the Galaxy” which also reminds us: ‘It is a mistake to think you can solve any major problems just with potatoes…’ which could apply to Venn diagrams which while showing the essential logical relations, contain not enough detail for thorough understanding let alone plans of action. This MindMap program remains flexible for additions, alterations and expansions as a ‘live’ working tool. Two levels down to which I pushed it for use in my presentation is illustrated above. 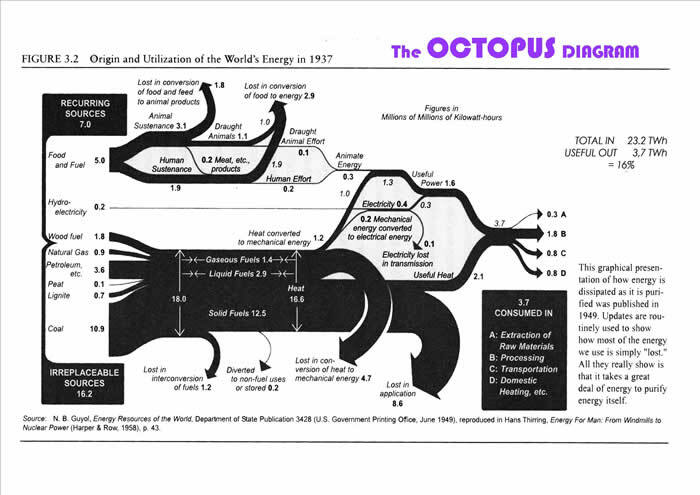 Octopus diagrams occur in my MindMap at the expansion of heading 6. 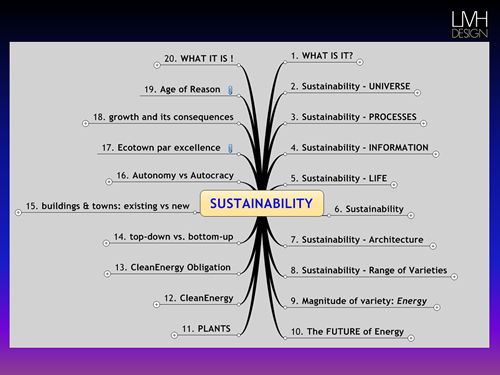 Sustainability - 6.2. Entropy – 6.2.2. Huber & Mills – 6.2.3.3 Octopus. Buckminster Fuller proposed his Design Science Decade 1965-1975 to the International Union of Architects during their congress in 1963 in Paris. It took John McHale and co-workers two years at Southern Illinois University to compile the documents for “five two-year phases of world retooling design proposed to the International Union of Architects for adoption by world architectural schools.” Nothing of the sort happened, but to this day I have not found a better definition of ‘what needs doing’, i.e. Fullers Design Challenge, or in short: Fuller’s Challenge – whichalso includes the exhortation: “Do more with less”. As a result, thinking of our grandchildren’s grandchildren – say 100-150 years from now – looks like a useful timespan to consider Sustainability. For ease of reference, let’s use the year 2100. FULLER’s CHALLENGE is, as stated, a design challenge, where ‘design’ is the designation of means to an end in ordered sequence. His challenge neatly describes the ‘aim’; the means to achieve this aim include physical as well as intellectual resources, or anything that human endeavour can muster to bear on meeting Fuller’s Challenge. This target to aim for is itself not something static, but like everything in the universe, an unending evolutionary process. There is a sheer endless variety of ‘means to ends’; an inkling of possible further subheadings can be found in Bruce Mau’s Massive Change. Here and in my ‘primer’ I concern myself in the following only with one aspect, namely energy – and electrical energy at that – without which nothing much else can happen. Energy also includes Fuller’s concept of energy providing everyone’s ‘energy slaves’ where erstwhile the availability of galley slaves or feudal peasants or Spartan helots determined ‘wealth’. Individual availability of energy emerges as the ultimate liberator from slavery. So come the year 2100, how much energy does the world need? At current a world population of 6.3 billion the world production of electricity is ~13TW which is the equivalent of 13,000 1GW power stations permanently online. UN medium population forecast is 9.0 billion for 2050 and equally 9.0 billion for 2100., On the basis of these population forecasts and Fuller’s Challenge, I calculated that come the year 2100 the Earth needs something like 60,000 1GW equivalent power stations in operation. 1.85 new 1GW power stations PER DAY, starting yesterday. And that is the magnitude of the energy problem to achieve sustainability on that account alone. OCTOPUS DIAGRAMS make the ins and outs of any process better understandable at a glance than anything else. 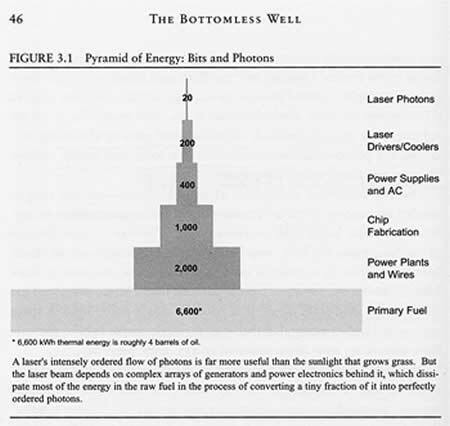 Huber & Mills’ Bottomless Well is the most important book for understanding ‘Energy’ that I have come across – may be, of course, because I had to start at the ‘bottom’, but even more so now that I have read up on the subject for several years. ‘Staggering’ was my reaction when I first saw this (and still is); considering that any laptop and TV set these days has a laser in it to read CDs or DVDs, the refined electrical power it uses is only 0.3% of the energy embodied in oil used to fire the power station from where it comes; a nearly unbelievable 99.7% of the original energy is ‘pure waste’ in normal parlance – and totally unavoidable at that – or entropy (when using its definition of energy not available for work). And that applies even while using the most advanced and efficient engineering on the way from energy source to your laptop. OK, it’s from 1937, but likely not much different in essence from the current situation. Again, it’s staggering to see that 84% of energy input from all sources becomes ‘entropy-waste’ before it arrives in useful form to do its ‘work’ for us. Even more surprising is to see that domestic use of 0.8 TWh is only 3.4% of the 23.2 TWh total input. Say you wanted to save 10% of domestic consumption – quite an achievement as global average – you would only save 0.0034% at the energy resources input side. So who is kidding whom when we are exhorted to use mercury poisoned ‘energy saving lightbulbs’ or not to leave our TV with its selftimer, cellphone and camera battery chargers or similar gadgets on standby. which in turn needs energy sources not suffering from any ‘peaks’ which in turn would again require methodical and technological upheavals- and arrive at the same conclusions too late. that it is not inefficiencies or sloppy engineering that waste or lose up to 90% or more of input energy through conversion and refinement to arrive at forms that can do work for us. that is ubiquitous in order to cut out the huge amount of entropy losses that otherwise arise from the long chains of conversions and refinements between source and use – proximity. How? Simple – we must learn from those forms of life that have sustained ALL life on Earth: that means Plants, i.e. the whole of FLORA without which there would be no FAUNA – which includes you and me. into food and living tissue. Black Swans will do so for a further similar timespan. Sunshine and its immediate derivative – Wind – are ubiquitous from the poles to the equator. 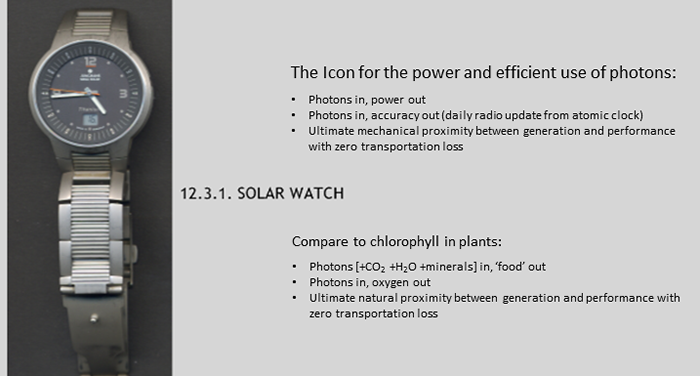 The ideal proximity of electrons in PV compared to plants minimizing entropy. ‘Energy Road’ -- an alliance of local authorities and regions aiming, and achieving energy autonomy, open for visits, stretching along a road corridor from Guessing in Burgenland at the eastern end of Austria to Morbach at the western end of Germany. Google will find further information for the underlined names, details also in the Primer. The median forecast for 2100 likely staying at the 2050 level, probably caused by the effects demonstrated by Hans Rosling, see http://www.economist.com/node/21013330 , or can be seen as Bucky Fuller’s energy slaves at work. A corresponding consultant sent me his assessment based on other information sources, arriving at 59,910 1GW power stations to be operational by 2100, or 1.70 needing to be built PER DAY from now on. Sorely needed is a computer program for their easy creation. Entropy is a thermodynamic property that is a measure of the energy not available for work in any thermodynamic process. It is defined by the second law of thermodynamics. Saving £s or $s would be a valid consideration, but energy supply and consumption is measured in kWh. Energy from insolation at the surface of the earth is in the order of 10 000 times current global consumption. (There are differing methods of measurement and I have seen anything between 7 000 and 17 000 times quoted; not a consideration when we are talking of a need in a region of 4 to 5 times). The Sustainability Primer shows some current household, community, municipal and regional examples using proximity to minimise entropy.